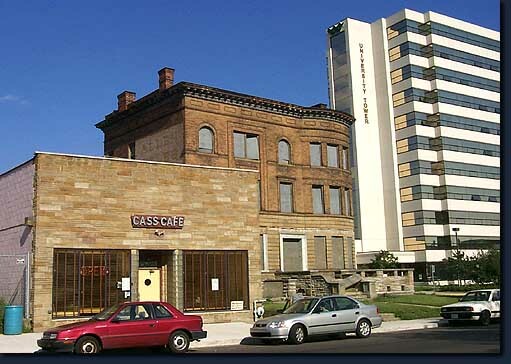 The setting of the Cass Cafe is telling of the North Cass Corridor. To the right of the cafe, the remains of a 19th C. residence awaits the actions of speculators in this rapidly reviving district. In the background is the recently constructed University Towers residences. It is built on the site of the former Vernor's factory, a structure that once hosted the Detroit Auto Show in the 1920's.